Since having children, our family has put travel and vacationing on the priority list. Although travel is important to us, we consider it a luxury that we save for after taking care of other financial priorities like maxing out our RESPs, TFSAs and RRSPs. As a result, there have been a couple of years where we have skipped a more extensive vacation for a lower cost staycation. As a family, we have traveled through the Maritime provinces to visit friends, Ontario a couple of times to visit family, and a few visits to Florida. For many Canadians, travel to a warm location is as simple as jumping in a car and start driving. While driving is an option for us, but since we live on an island (Newfoundland, Canada), it’s much more time (thus cost) efficient to travel by plane. Having said that, traveling by plane is not cheap, especially when covering four plane tickets (2 children). For example, if we were to book a spring vacation to Florida today, the flights would probably cost us around $650-$750 each or $2600 to $3000 for all of us. However being the deal seeker, this past spring we managed a two-week Florida vacation (with a week on the beach) for less than $4,000 CAD (fixed costs including flight, accommodations and car rental). If we count the use of credit card cash back rewards, then our fixed costs were actually closer to the $3,400 range. Low Season – Time your travel for low season as prices tend to be lower for flights (and accommodations). Low season is typically after kids start school in September until Christmas (exception being the long weekends in between). After Christmas until Easter, then after Easter until school ends (typically in late June). Our visits to Florida have been just after Easter thus far. However, this may change as the kids get older and the homework gets heavier. Newsletters – Sign up for major airline newsletters and you’ll be the first to know if there is a seat sale. Timing – If a seat sale doesn’t happen, I’ve noticed that the best prices are about 8-10 weeks before an international flight and 4-8 weeks before a domestic flight. Use the Web – Use aggregate websites like “fly.com/kayak.com/google flights” to keep an eye on prices. I like using kayak’s flexible flight feature that provides a grid of prices for a range of dates. You’d be surprised at the price difference flying one day before or after your planned dates. Use Points and/or Credit Card Rewards – We aren’t big points collectors for flights, but we do collect cash back rewards. We accumulate cash back rewards and redeem once a year towards travel. For our last trip, we redeemed about $600 in cash back rewards to help offset some of our expenses. For Aeroplan collectors, here are some of my favorite credit cards to help build your points balance. For air miles collectors, here are my tips on how to accumulate serious air miles and my favorite air miles credit cards. An earlier article on how to save money on car rentals explains a strategy that I have used a few times to help get the best price possible on a car rental. The crib notes include: watch car rental prices over a few weeks on Hotwire until you see a price that you are happy with. Then bid a slightly lower price on Priceline. I haven’t used this strategy in a couple of years now as I’ve found Costco’s car rental service to be very competitive in pricing. You can cancel at any time prior to the date of travel, and some of their vendors waive the additional driver fee for your spouse. Some car rental companies charge as much as $15USD/day for an additional driver which adds up over a two week vacation. One more tip (or two), if you book a car through Costco, make sure to bring your Costco card with you on vacation – the car rental agency may require it at the counter when you pick up your vehicle. Another tip, a number of credit cards (and car insurance policies) will cover car rental collision coverage. So make sure to check your paperwork or make a few phone calls to see what kind of coverage you have. With flights being the bulk of the vacation cost, accommodations are a close second. With two young kids with varying palates, we tend to cook a lot – even during our vacations. So this means that a hotel is out of the question, unless we book a multi-bedroom hotel suite with a kitchen. Most of the time, this type of suite is more than what we are willing to pay, so we typically rent a two or three bedroom condo for a fraction of the cost. To put this in context, we rented a nicely decorated three bedroom condo at a small resort just outside Orlando for $500USD (for a week). Where do we find places to stay? Typically through word of mouth, through reading reviews online, and scouring through sites like VRBO/AirBnB etc. We tend to stick with gated resorts with a minimum of one pool. So the next time you take an extended trip, make sure to check out housing/condos in the area and compare them to hotel prices. You’ll not only save on rental costs, you’ll save on food/dining costs by having the option to eat in, and don’t forget the intangible benefit of having more space. I’ve written a number of articles in the past on how to save money on foreign exchange (FX). Banks and credit cards typically take about 2.5% (or more) on top of the FX rate. It’s a sneaky fee that is hugely profitable for institutions. In light of this, there are now free credit cards for Canadians that charge 0% surcharge for purchases in foreign currencies. The Amazon Visa that waives the FX surcharge and gives you 1% cash back on top – effectively a 3.5% return when spending in a foreign currency. Rogers has also introduced the Rogers Rewards Mastercard and the Fido Rewards Mastercard that gives 4% return when spending in a foreign currency. There is also a premium annual fee based card that waives the FX surcharge – The Mariott Visa. More details and analysis on these cards in a future post. 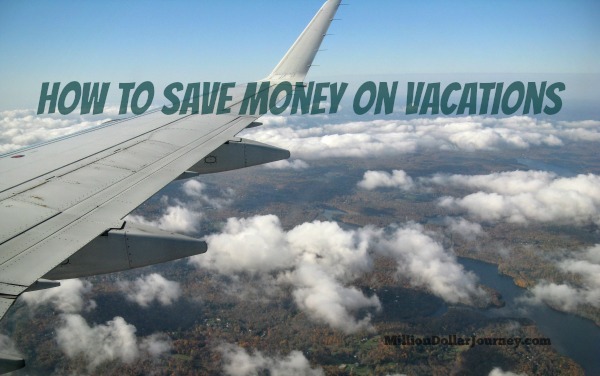 There you have it – most of my strategies for saving money on vacation expenses. For you seasoned travelers out there, do you have any tips for me? Going on the off season (what you call low season) is the best way for us to save money. Our kids were homeschooled so we could go whenever we wanted. One year we started school early (mid-August) and then took a Disney vacation the second week of September when everyone else was back in school. We saved on flights, hotel (got a 3-bedroom condo 10 minutes from Disney for $79 a night! ), car, etc. In addition the lines were very short. The longest we waited for a ride was 15 minutes. Most rides we simply walked on. So going in a low season saved us tons of money AND made the vacation much more enjoyable. Thanks for sharing your experience. Ours has been the same during off season. I’m not sure where you are looking (or not looking, for that matter)…but your flight costs are WAY out to lunch. Even your $1700 would be on the high side of average. $1700 for 4 people from St. John’s, NL to Orlando? I thought it was a pretty good deal! Agreed, $425 taxes in to fly NL to FL is a great deal. That probably wouldn’t even get you to Toronto. Americans have it so good with cheap flights. For Canadians, be sure to sign up to YYYdeals.com, where the YYY is replaced by your local airport code. For example, Toronto would be YYZdeals.com. There is one for all airports in Canada that have international options (26 in total). They often post crazy last minute flight deals or amazing flight offers. As an example (All prices are return flights), they had TO to beijing and HK for 591 all in. Or Calgary to Tokyo and Cambodia for 617. The best deal I ever saw was Edmonton to Tokyo for $300, taxed included. Unfortunately, we had just gone to Japan a couple months earlier. Thanks for the link to that deals website Nobleea! Great tips we are doing something similar with our family vacations too. I didn’t realize that Costco do car rentals until you mentioned it, definitely need to check out next time we need a rental car. If you can travel any time you often can find some really great last minute deals. Hi Tawcan, thanks for stopping by. Do you have a favorite website for last minute deals? Living in the Caribbean can have its challenges. It’s always difficult to find really good fares to the USA especially if you’re not travelling to Miami or New York. I would check a million sites at crazy hours of the morning just to see if I could get a good deal. Just thinking about it makes me tired. But I agree with travelling during the low season – stay away from Thanksgiving and Christmas. When it comes to foreign currency transactions, the Amazon card is far better than other cards. As you point out, you get an effective 3.5% benefit on foreign currency transactions. By comparison, you note that Rogers and Fido cards give a 4% cash back on foreign currency transactions but neglect to note that these cards charge the 2.5% currency conversion surcharge, thus making the benefit as only 1.5% compared to Amazon’s 3.5%. Hi John, thanks for the email. If you work out the numbers, the Rogers/Fido card still have a 0.5% net benefit over the amazon card for foreign transactions. Flying out of nl is very expensive. I was able to use air miles to book an offseason trip to New York. Thought it would be a good short and fairly affordable trip. Until I seen the accommodations costs for nyc. Wow,! Hi Bernie, we’ve done NYC from here a couple of times. The flight out can be reasonable, but hotels are very pricey in NYC during the fall. A “good” rate is $350+ CAD/night. If you collect hotel points, the return on spending can be favorable. Are there any major Canadian CCs that offer favourable FX conversion rates? If you work for a megacorp, you may get corporate discounts for car rentals and hotels that you can use for personal travel. Your company may also be part of http://perksatwork.com or http://ticketsatwork.com. Disney Park ticket or other amusement park tickets can be very pricey at $100 per person per day. These sites can provide good discounts. Next post: Reader Mail: I have $1M+ Net Worth – What’s Next?